Some of you may have seen this story over at Android Life, but we wanted to quickly point it out here as well to address a rumor or suggestion that many people are making. This new Exynos 1.5GHz processor that Samsung announced is not going to be in the Galaxy Nexus or Nexus Prime or whatever you want to call it. We are almost 100% certain at this point that Texas Instruments’ OMAP4 was chosen to be the lead platform for developing Ice Cream Sandwich which also means it should be in one of, if not the first device running the newest version of Android. There are rumors of the 1.5GHz OMAP 4460 being delayed (the chip expected to be in it), so if we do end up seeing an OMAP, it could be the 4430 overclocked as a “Turbo” to 1.2GHz instead. (Yes, the OMAP 4430 is the same chip in the Bionic and DROID3.) Or who knows, maybe they scrapped OMAP and went with Qualcomm’s S3? No one is certain just yet, but this new Exynos is probably out of the question. And let’s also not forget that this new chip from Samsung doesn’t start “sampling” until the end of this year, so there is almost zero chance that it would come loaded in a device that could be here within the next month. Talk about record processor testing. 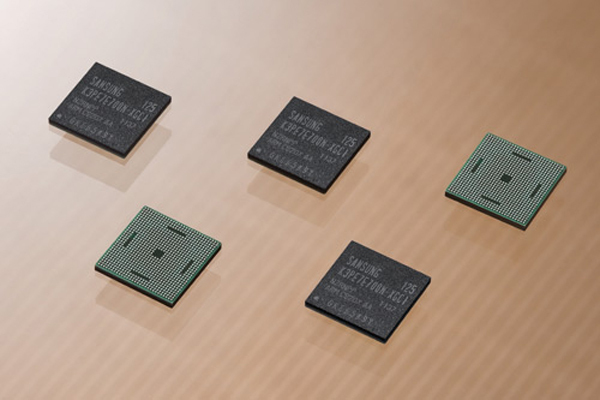 There have been surprises in the past, and we would certainly welcome in the 1.5GHz Exynos and the fact that it is 30% more efficient, but this move seems highly unlikely. I guess we will find out for sure on October 11.